As I'm looking to make my little corner of the world a small - really small - food forest, I'm looking at legumes of all kinds. I'm also trying to make this as compatible with the local wildlife as I can, so we can all live together a bit more peacefully. The poor rattlers are left out in the cold, for now, kept out of the backyard, but when the kids are grown and gone, I think they can come back in and visit if they like. Today I'm focusing on the velvet and honey mesquite trees, or specifically, what I can grow near my mesquite trees. According to Desert Harvesters, the following grow well under mesquite trees and around them: canyon and desert hackberry, velvet ash, Atriplex canenscens[four wing saltbush], panic grass, six-week gramma grass, fringed amaranth, jojoba, desert honeysuckle, condalia, greythorn, wolfberry, Mormon tea, hopbush, barberry, Texas mulberry, barrel cactus, Christmas cholla, snapdragon vine, Tumamoc globeberry, and chuparosa. 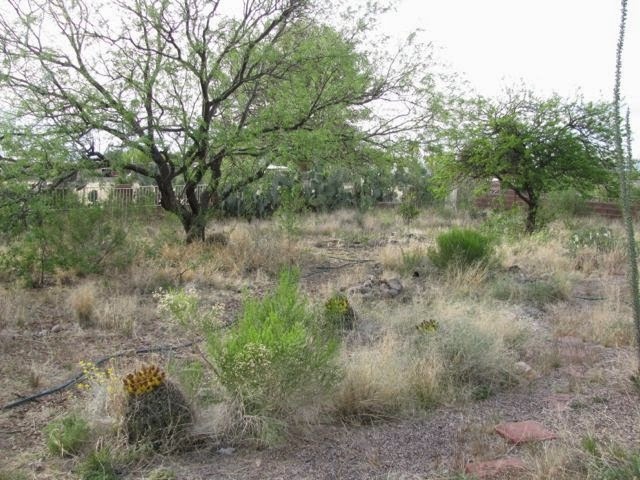 Also, they recommend velvet mesquite and honey mesquite as the two types to plant in the Sonoran Desert. Velvet Mesquite preferably as it is native, and honey mesquite has been expanding in territory. I'll try to note down something about each of the above plants as I learn them. But please remember this is from a layperson's perspective, not an expert. Please check any information on these, eh? Especially on the uses for various plants. There is frequently conflicting information on the web, so always confirm anything I say with someone you trust, please. Canyon and Desert Hackberry - Desert Hackberry is a twisty, thorny bush, but it can grow quite tall. Very spiky, so it might make a good barrier. Edible pale orange berries. The more water they get, the better the berries are. If there's not much moisture, the berries are blander and more mealy. I'm noticing, however, that these were growing a small distance away from mesquites around here, although up close with desert acacia, and underneath the hackberry I'm finding little to no growth of ANYTHING. I'll keep exploring to see if they might be a little allopathic. Canyon Hackberry is a taller tree, which grows slowly in normal conditions, but growth can be quite fast if given more water. It has edible berries as well, larger than the Desert Hackberry. Velvet Ash - Riparian tree. Swallowtail larval food. Atriplex canenscens (Four wing saltbush) - Shrub, source of yellow dye, edible seeds, possibly. The seeds seem to be in question, with some saying this variety has edible seeds, and some saying only another variety does. Still researching. Panic Grass - A rare grass with edible seeds that can be ground up and added to your food. This can be purchased at Native Seed Search online, when they have it in stock. six-week gramma grass - A summer annual grass. May be edible. Fringed amaranth - Small annual with rather pretty, drooping, head of small white flowers on the stalks. Edible seeds, but very small. Another local variety, Palmer's amaranth, has edible leaves and seeds. The fringed amaranth leaves are too small to be of much use. Palmer's amaranth dries with much spikier thorns encasing the seeds. Jojoba - Shrub, can grow pretty large. Does very well in hot temperatures, with an interesting growth of leaves that all turn sideways so only the thin side is exposed to the sun during the hottest part of the day while the flat of the leaves gets the morning and evening sun. They are not usually seen up here - I'm just a bit too high in elevation for a comfortable temperature, but they might survive and do well if sheltered or grown near a wall that would radiate heat during the evening. Edible seeds, but only in small amounts, usually roasted. Seeds contain a liquid wax, jojoba oil. Foliage or nuts can provide food for rodents, rabbits, javelinas, deer, and some birds. Desert honeysuckle - Shrub, pretty orangey-reddish flowers. Might be a nurse plant for barrel cactus - I keep seeing them after they've died, with a barrel cactus right in the base of the dead honeysuckle. Attracts hummingbirds. Condalia/Bitter Condalia - Shrub. Nearly black berry which is bitter but edible, according to some, and poisonous, according to others. Maybe edible in an emergency, I suppose? I believe birds enjoy these berries. greythorn - shrub, berries are eaten by local quail. wolfberry - Thorny shrub with bright red edible berries. Many varieties. Mormon tea - Shrub, tends to grow near washes. Roots help bind the soil. The variety I see around here is Longleaf Mormon tea. One can make a tea from the ends of the branches, if gathered when green. This is an ephedra and is both a nice mild decongestant for congestion caused by allergies, plus a mild stimulant. It tastes a bit like a weak Lipton tea, and if you are sensitive to caffeine, I wouldn't drink it past the afternoon; it keeps me up if I drink it too late in the day. Plants are either male or female. Hopbush - large shrub, evergreen, food for a night flying moth, Canyon Towhee (bird) searches for food underneath it. Texas mulberry - Small tree with edible fruits, self-fertile (male and female flowers on same plant). Christmas cholla - Small, twiggy cactus with edible fruits. It gets its name because it has fruit in the wintertime, the only cholla to do so. The others get fruit in the spring. Snapdragon vine - Woo hoo - found one in a nearby arroyo! It's already going to seed, but I noted down the location to see if I can catch it next year with flowers! Chuparosa - A twiggy shrub, drops leaves in cold and draught conditions. Red flowers attract hummingbirds. I've heard desert honeysuckle and chuparosa used interchangeably, but they do NOT seem to be the same thing. Chuparosa flowers may be edible, and the plant may be medicinal and used for dye. Catclaw acacia - I'm seeing a lot of catclaw acacia near the mesquites in a nearby arroyo. They grew closer to palo verde, but were still fairly close to mesquite trees, as well. chia - also found this frequently in open spaces next to mesquite, just outside the shade zone of the tree, usually. Sweetbush - usually nearby, but not directly underneath. Small perennial bush, tiny yellow, fuzzy flowers, attracts insects with attracts small birds.